We’d love your help. Let us know what’s wrong with this preview of On His Bended Knee by Shanae Johnson. Sgt. Dylan Banks lost more than just his leg in the war. His fiancée and family turned their backs on him as well. Now, he’s determined to create a safe place where wounded warriors like himself can heal. But a hidden zoning law requires all residents of the Purple Heart Ranch She needed a place to stay. He needed to save his ranch. Together they just might make a home. To ask other readers questions about On His Bended Knee, please sign up. This starts with a sympathetic vet assistant. She loses her job and home because of taking too many dogs home with her. To save herself and the therapy ranch for disabled veterans, she enters into a marriage of convenience. On His Bended Knee by Shanae Johnson is a 4 star read. Dylan Banks is a war veteran, when he came home injured his fiancée and his parents turned their back on him as he now didn’t fit into their “ideal” world. Moving to the Purple Heart Ranch along with other wounded vets, who he now classes as his family, he’s happy with his life or is he?? When he’s told that the grounds he want to buy have been set out for families Dylan knows he needs to do what he can to keep the Ranch for his new family. On His Bended Knee by Shanae Johnson is a 4 star read. Dylan Banks is a war veteran, when he came home injured his fiancée and his parents turned their back on him as he now didn’t fit into their “ideal” world. Moving to the Purple Heart Ranch along with other wounded vets, who he now classes as his family, he’s happy with his life or is he?? When he’s told that the grounds he want to buy have been set out for families Dylan knows he needs to do what he can to keep the Ranch for his new family. Maggie Shaw has been abandoned by people all her life, from the parents who left when she was at school to the foster parents who only used her for money and free childcare, so working as a vet tech she can’t help but rescue the injured dogs who would be put to sleep and takes them home with her, but it’s the injured dogs that makes her lose her job and home all at the same time. When the chance comes up the go to the Purple Heart Ranch Maggie’s life night just change. This was such a great story of two wounded people with the ability to heal each other. Okay so, first of all stories like this normally aren't my cup of tea. But this one touched my heart a little. Currently I am studying to be a Vet Tech so I was able to strongly relate Maggie. I also worked with horses for a good amount of time. So this story really piqued my interest. I also come from a military family! So it was almost like I was supposed to come across this book! I enjoyed the story, it was short, sweet and was able to keep my attention. I wouldn't say I would seek out the re Okay so, first of all stories like this normally aren't my cup of tea. But this one touched my heart a little. Currently I am studying to be a Vet Tech so I was able to strongly relate Maggie. I also worked with horses for a good amount of time. So this story really piqued my interest. I also come from a military family! So it was almost like I was supposed to come across this book! I really thought that this was a well-written book about a difficult subject. Wounded veterans are living on a ranch where they are rehabilitating both their bodies and souls. Their psychologist on the ranch, Dr. Patel, is also a minister at a church where Maggie has been a member. Maggie has lost her job and home due to the wounded animals that she’s adopted. Dylan, the owner and founder of the ranch finds out that they lose the ranch if they don’t have wives so he’s decided to find a wife of c I really thought that this was a well-written book about a difficult subject. Wounded veterans are living on a ranch where they are rehabilitating both their bodies and souls. Their psychologist on the ranch, Dr. Patel, is also a minister at a church where Maggie has been a member. Maggie has lost her job and home due to the wounded animals that she’s adopted. Dylan, the owner and founder of the ranch finds out that they lose the ranch if they don’t have wives so he’s decided to find a wife of convenience to help him save the Purple Hearts Ranch. Dr. Patel sends Maggie and her dogs to the ranch as maybe a solution to both of their problems. series. If the rest of the series is as good as this first book, Ms. Johnson is going to have a winner of a series. Book one is about Sgt. Dylan Banks a wounded warrior and his bride of convenience veterinary technician, Maggie Shaw. Dylan is forced to find a bride quickly, due to an obscure zoning law requiring all the residents of the Purple Heart Ranch to be married. Maggie is desperate to find a home after her landlord kicks out for harboring her dogs in her apartment. Having lost both her job and her apartment on the same day Maggie accepts Dylan's marriage of convenience proposal as a solution to her problem. Can these two damaged people find a way to make their marriage of convenience into the real thing and find their true HEA? You will have to read this heartwarming story to find out. So read and enjoy. This clean, sweet and touching story is the start of the new series titled The Brides of Purple Heart Ranch. A ranch for veterans that have been injured physically, mentally and emotionally. A place for healing, that is safe and peaceful. .It’s a story that at times is heartbreaking but also heartwarming and thought provoking. A reminder that as a society we need to do more for the brave men and women who are willing sacrifice themselves for us in the name of freedom. Both Dylan Banks, the owner This clean, sweet and touching story is the start of the new series titled The Brides of Purple Heart Ranch. A ranch for veterans that have been injured physically, mentally and emotionally. A place for healing, that is safe and peaceful. Both Dylan Banks, the owner and founder of the ranch and Maggie Shaw, the veterinary technician, have huge hearts . But those hearts have also suffered a great deal. You’ll enjoy not only watching these two interact, but also meeting the rest of the group living at the ranch. Looking forward to more books in this series. Out of a heartbreaking story, comes a truly inspirational message. One emotional journey, two unforgettable characters and an exceptionally gifted author make a winning combination. On His Bended Knee is more than just a sappy love story. Johnson uses Dylan and Maggie to inspire hope at a time neither have any left. Out of desperation grows a bond that becomes the salve that mends the body, mind and spirit of two broken souls. Neither life or love is perfect, but beauty surrounds us even in the Out of a heartbreaking story, comes a truly inspirational message. One emotional journey, two unforgettable characters and an exceptionally gifted author make a winning combination. On His Bended Knee is more than just a sappy love story. Johnson uses Dylan and Maggie to inspire hope at a time neither have any left. Out of desperation grows a bond that becomes the salve that mends the body, mind and spirit of two broken souls. Neither life or love is perfect, but beauty surrounds us even in the most ugly of times. A soul stirring, awe-inspiring, epic tale. This is a very sweet story, about a woman with no job and evicted from her apartment for too many dogs. It's about a man who served our country and lost his leg. It's also about a bunch of veterans trying to make a ranch their home. One marriage of convenience to save the ranch, and two people find they have a lot in common. Love heals Maggie and Dylan's soul. Dylan finds with Maggie he can overcome his spiritual injuries. This compassionate story really made me think of our wounded veterans and hope there are ranches where they can recuperate and feel whole again and feel accepted. I enjoyed this story for that reason. The characters of Dylan Banks and Maggie Shaw really pull you into the story, especially Maggie. I cannot imagine a childhood like hers and felt such compassion for her. I received an advance copy of this book and I willingly chose to write an honest review. Loved this story. The hero is a wounded vet, who starts a ranch to help the other wounded vets in his former unit live in peace and self-sufficiency in private. The heroine is a veterinary assistant who, against her boss's orders, has spirited away five wounded dogs destined for euthanasia, and has lost her job and home as a result. Very lovely, emotional story. So many souls to heal - I'm in. Wanted it to end with repairing the spirits of the people in Maggie's old life. The story is so full of helpfulness and encouragement, something that I think a lot of us are missing today. It is a reminder that there are people in your corner even when the space feels empty. I cannot wait to see where this series is going. The first book here is one adventure you do not want to miss out on. Dylan and Maggie have big hearts and plenty of friends to watch over them. A well written perfectly paced story pulling you in from the start. Wow, this was a fantastic book. Dylan and Maggie were very relatable. This was such a feel good story that it keeps you flying pages. I’m very impressed with this author and I look forward to many more books from her. Can so broken souls heal each other while trying to save a magically place? Can Dylan, ex-army without a leg after a very serious injury while in duty, and Maggie, vet technician, without a job, family or home, have a future together even with a convenience’s marriage? A sweet love story. Such a great book about returning military men. Dylan is recuperating with his friends on the Purple Heart Ranch. They have to get married to stay on the ranch do to a zoning law. None of them think they can have love especially Dylan. 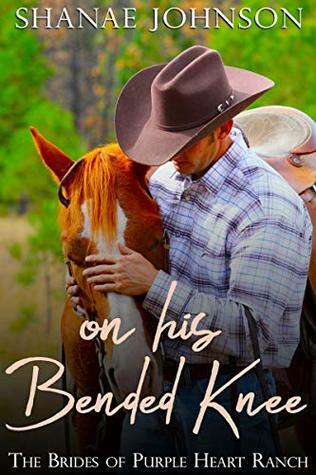 On His Bended Knee is the first installment from The Brides of Purple Heart Ranch. I thought it was a great read and I look forward to book two. I give this one four stars. Shanae you have a GOD given talent. This story was precious. Each person was so likeable and the dogs as well. The story was so good and interesting. I read it in two sessions not wanting to put it down. Looking forward to next story. Cried at the end --so good! A touching story of a veteran trying to do what is right for his men who came back from war not quite whole in one way or another, a woman who rescues the broken animals who enter her life and what happens when their life is intersects. I loved this book!! Can’t wait to read more in the series!!! A very heart warming story. There is truly someone for everyone. I cried a lot but I loved it. I received a complimentary review copy of the book and I am voluntarily leaving a honest review. I liked this story just wish it had been a little longer.I'll be reading the rest of this series.Really looking forward to it. I enjoyed this story about overcoming and adapting after tragedy. This is a great beginning for this series of soldiers and the women they will love. This was a good story about the scars people carry, both physically and mentally. It was a sweet, clean romance. This book needs more of a plot. It is very short, the author could have gone into a few more details.